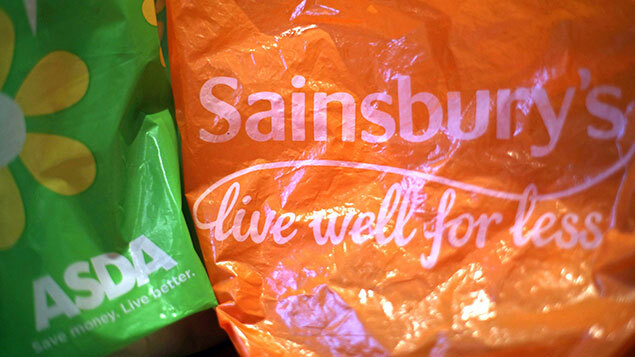 The GMB union has called the newly announced merger proposal between Sainsbury’s and Asda a “bargain basement” deal that could risk hundreds of thousands of jobs. Sainsbury’s announced plans to merge with Asda – currently owned by US supermarket giant Walmart – this weekend, promising that prices would fall at both chains and claiming that there would be no store closures. The deal now has to be considered by the Competitions and Markets Authority, as the combined market share of the two brands will be 31.4%, compared with Tesco’s 27.6% share of the grocery market (according to figures from Kantar Worldpanel). According to Sainsbury’s chief executive Mike Coupe, who will run the new business, both brands would be maintained. The combined purchasing clout of the two businesses could place suppliers under pressure, further risking jobs in the retailers’ supply chain. And despite promises of no store closures, analysts suggest that in order to gain regulatory approval it could become necessary to sell off some stores. Together, the two businesses currently employ around 330,000 staff across a total of 2,800 stores. Rebecca Long-Bailey, shadow business secretary, said she was concerned about an “emerging monopoly” if the deal goes ahead. “It will be British shoppers that suffer from rising prices and British workers that may be fearing for their jobs if this goes ahead without adequate oversight and investigation,” she said. GMB general secretary Tim Roache said: “It remains to be seen if this ‘supermarket sweepstake’ is the real deal or a bargain basement ready meal. “Hundreds of thousands of workers stand to be affected, and all know such announcements tend to be followed by management speak like ‘rationalisation’ in the name of ‘efficiency’. What that usually means is job losses or cuts to pay, terms and conditions which would be wholly unacceptable. Mike Cherry, national chairman of the Federation of Small Businesses, called upon Sainsbury’s and Asda to explain how the two companies would merge their supply chains, asking them to “give reassurance that cost savings won’t be achieved simply by milking their small suppliers for all they’re worth”. Both Asda and Sainsbury’s are currently involved in substantial equal pay claims brought by thousands of woman who believe they were paid less than male counterparts for doing work of equal value.